This strange contraption is a fire pump which was operated by two people to pump water in the event that a fire broke out. Fire was a constant threat due to the number of thatched roofs and open fires. We believe this photo is very old – probably around 1890. The pump is stored in a small shed inside the church porch! 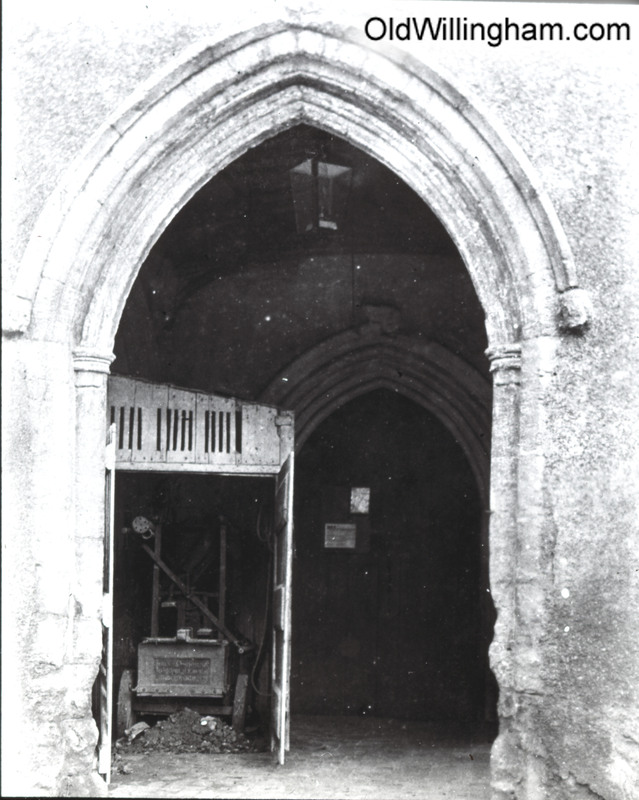 The bad state of the porch shows that it was before the major restoration carried out by Rev. Watkins in the 1890s. The church was seriously neglected in the latter part of the 1800s because most of the village was “non-conformist” (i.e. Baptist or Methodist) and the Rector typically lived elsewhere, collecting the tithe money from afar. Watkins was the first rector to take a serious interest in the village and the church for a long time.